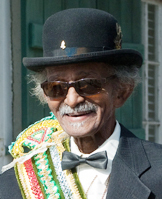 On July 23, 2011, at age 79, Lionel Batiste led a jazz funeral second line in Molde, Norway, for victims of horrific terrorist attacks perpetrated by a lone madman just one day earlier. While the shocked nation struggled to cope with the senseless massacre, Lionel helped the country’s healing process begin as he led a solemn procession of mourners through the ancient Norwegian town of Molde. With his calm demeanor reflecting an aura of peace and serenity, the man known locally as “Uncle Lionel” shared his gift of healing jazz with a country in desperate need of solace. Long one of New Orleans’ most beloved traditional jazz musicians, Lionel Batiste has come to personify the spirit and soul of New Orleans throughout much of the world. Usually dressed in a formal black suit, hat, white shirt, spats and sequined sash, Lionel’s physical appearance projects an image of time-honored tradition and complements his polite, gracious manner. Primarily known as vocalist and bass drummer for the Treme Brass Band, Lionel happened to be touring in Norway the day of the attacks. Eager to ease the pain of fellow citizens, Norwegian officials asked Lionel to lead a second line through the streets and help the country recover from its collective shock. Through life experience, Lionel Batiste has learned acceptance. He has developed an inner strength and contentment, borne from experiencing the highs and lows of life. Lionel has witnessed the depth of adversity, but knows that joy and peace are sure to follow. It is said that good things come from being in the right place at the right time. How fortunate for Norway that Uncle Lionel was there. Lionel Batiste… Peoples Health Champion.